“Country Royalty” is billed as a ‘tribute” show, but it is more than just a standard greatest hits review. In addition to singing the “role” of Hank Williams, Sr., performer Jason Petty acts as lecturer, evangelist, and unabashed admirer of the “Father of Country Music.” Consequently, the show succeeds on many levels. Dedicated fans are obviously quite pleased with Petty’s portrayal, lavishing him with generous applause, as if he was the legend himself. The uninitiated come away with a richer understanding of a talented man with the added bonus of a toe-tapping soundtrack. Williams was influenced by and wrote in a variety of styles, from honky-tonk rave-ups to spirituals. Even those who are not country music fans have undoubtedly heard “Hey Good Lookin’, “Move It On Over” or ‘I’m So Lonesome I Could Cry”. In an unusual twist on the tribute show format, the second half, focusing on Patsy Cline, is also narrated by Petty, albeit as himself. Carolyn Martin’s remarkable voice is well suited to all of Cline’s hits, from “Walking After Midnight” and “Crazy” to “Sweet Dreams.” In fact, her strong voice seems to be taxing the sound system at CityStage to the limits, causing some distortion. Though Cline’s career was shorter than Williams own brief career it did seem her story was given a shorter shift . Backing both performers is the “The Country Royalty Orchestra,” a talented, tight, and polished ensemble of piano, drums, bass, slide guitar, and fiddle. It is unfortunate that they are not given named credit in the program insert. Their authentic sound is every bit as important to the success of the show as the remarkable talent of the leads. 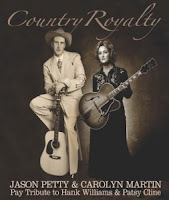 “Country Royalty” is a unique, educational, and entertaining night of music, bringing to life two important and historical figures in a vibrant, compelling way.